Cascade by Maryanne O’Hara is set in 1930s Massachusetts as the rest of the world is on the cusp of war with the Nazis and Boston is hoping to alleviate its water shortage by creating a new reservoir along the Cascade River. Painter Desdemona Hart Spaulding lives in the sleepy little town of Cascade, which has been a target of lawmakers looking for water over the last decade. Her life is nothing like she expected as her family falls on hard times, and she makes a life-altering decision to marry Asa to save her father and her home. What she fails to realize is that some decisions are made for you by circumstance and fate in a cascade of changes that you can either fight or ride. From the moment readers meet Dez, they know that she is conflicted about her new role as wife. She makes her husband’s breakfast and tries to care for her father, but her mind wanders to her studio, her paints, and her canvases, making her lose track of time as she dives into the colors and scenes she creates. Asa is hard to grasp as he seems to want to be oblivious to his wife’s struggles, but is forced to see reality when his wife makes decisions that place them both in the spotlight as the town looks for ways to save itself from drowning. O’Hara’s novel is not just about the cascade of decisions and twists in one’s life, but also the unexpected changes that face a country in a depression on the verge of a possible world war — at a time when sentiment against Jews is turning negative as many people lose their jobs and are thrust into poverty. Things spiral out of control for the Spauldings and the town, but Dez is determined to follow her innate desire to pursue her art in spite of her duty to her husband and her father’s legacy as she hopes to turn public sentiment in favor of saving Cascade from the water department. The parallels between the river and how it can shape a town and how events can shape people are deftly made in O’Hara’s lyrical prose. She intertwines Shakespeare’s plays and famous quotations easily, tying Dez to her father’s legacy throughout the novel even when she has all but abandoned it in favor of an affair of art. While Dez can seem immature in her clinging to Jacob, a traveling salesman, it is clear from her relationship with Asa that she’s never been in love with anything other than Shakespeare as seen through her father’s theater in Cascade and her own painting. She is an artist that needs to feel substantial loss and pain before she can fully come into her art. O’Hara has created a novel about the tensions between duty and desire and following one’s dream. She has captured the struggle of artists, who unfortunately are too often misunderstood by non-artists, to achieve the time necessary to create without the guilt of failing to meet the obligations of family life and other relationships. Through gorgeous descriptions and painting techniques, O’Hara plunges readers into the light-filled studios and landscapes of Dez, as well as into her nightmares, her guilt, and her nostalgia for things past. Through quick brushstrokes and scraped canvases, the novel transports readers into muddied waters and into the bold color of an artist’s life. 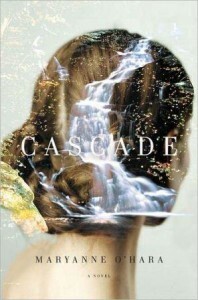 Cascade by Maryanne O’Hara is a debut that shimmers like the rushing river over the rocks of the waterfall with its quiet power shaping Dez and what was once Cascade, Massachusetts. Maryanne O’Hara was the longtime associate fiction editor of Ploughshares, Boston’s award-winning literary journal. 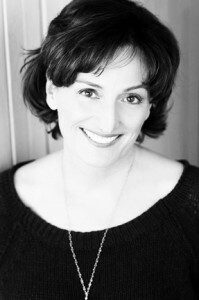 Her short fiction has been published in magazines like The North American Review, Five Points, Redbook, and many anthologies. She has received grants from the St. Botolph Foundation and the Massachusetts Cultural Council, and her story collection was a finalist for 2010′s Flannery O’Connor Award for Short Fiction. She lives on a river near Boston. Find out more about Maryanne at her Website, her blog, and connect with her on Facebook. 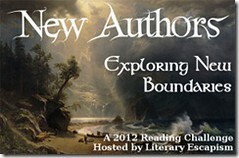 This is my 83rd book for the New Authors Reading Challenge in 2012. Mailbox Mondays (click the icon to check out the new blog) has gone on tour since Marcia at A Girl and Her Books, formerly The Printed Page passed the torch. This month’s host is Bermudaonion. 1. Cascade by MaryAnne O’Hara for a TLC Book Tour in December. 2. The Missing Manuscript of Jane Austen by Syrie James for review.